The Final Thursday Reading Series Fall 2016 season features Taylor Brorby on Thursday, October 27th in Cedar Falls, IA. FTRS is held at the Hearst Center with an open mic starting at 7 pm to share five minutes of poetry fiction or creative non-fiction. Singer-songwriters are also welcome. 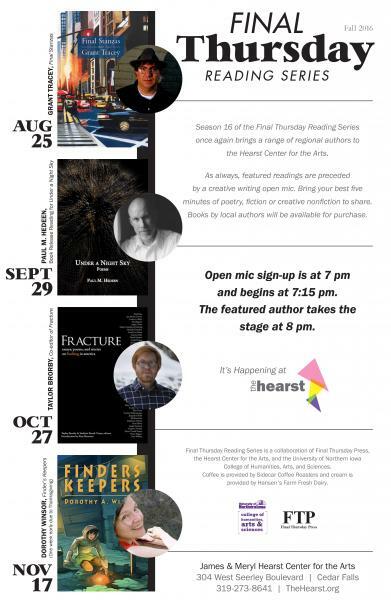 The featured reader takes the stage at 8 p.m. FTRS is a collaboration of Final Thursday Press, the Hearst Center for the Arts, and the UNI College of of Humanities, Arts & Sciences. For more information, check out UNI’s FTRS Fall 2016 Readers.